Our friends at Midsouth Shooters Supply have announced that Midsouth is now taking orders on Hornady’s much-awaited Zombie Max™ (Z-Max) loaded ammo. Hornady is marketing this stuff as “Zombie-killing” ammunition. Hopefully buyers will read the warnings and understand that the new Z-Max ammunition is 100% lethal and deadly. This is NOT some kind of paintball ammo or less-than-lethal substitute. The Z-Max line includes jacketed rifle ammo with bright green polymer tips, hollow-point pistol ammo with bright green polymer end-plugs, and conventional 00 Buck shotgun ammo in a special black (with green lettering) shotshell. Currently, Hornady plans to sell the following types of Zombie Max ammo: 9mm, 40SW, .45ACP, .223 Rem, 7.62×39, .308 Win, and 12 gauge (2 3/4″ shotshell). Commentary: Maybe Not Such a Great Idea? For some folks the notion of blasting zombies is an amusing fantasy. But it is only that — a fantasy. It is merely “make-believe”. We’re not so sure that associating fantasy zombie-killing with the use of actual, lethal ammunition is a very good idea. Frankly, we have serious misgivings about this entire Zombie Max marketing effort by Hornady. The product graphics and supporting advertising make Zombie Max ammo seem like something used for Halloween fun and games. Hornady’s product flyer declares: “Supply yourself for the Zombie Apocalypse with Zombie Max™ ammunition…. Remember. . .only head shots count!“. Is that really wise? Hornady is even distributing a video featuring an anxious shooter apparently firing live Zombie Max rifle and pistol ammo at persons dressed like zombies. How that got past the lawyers we’ll never know. Hopefully people will realize that Zombie Max ammo should be treated like any other 100% lethal ammunition. Read Hornady’s warning: “This is Live Ammunition. 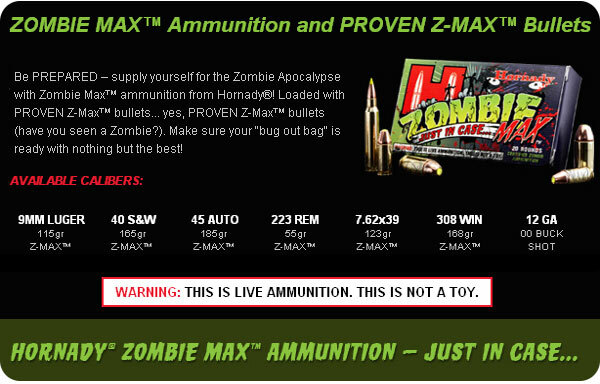 This is not a toy.” Then follow all basic firearms safety rules when using Hornady’s Zombie Max products. And hopefully, this Halloween, no moron will try out his Zombie Max rounds on some grade-school trick-or-treater in a zombie costume. 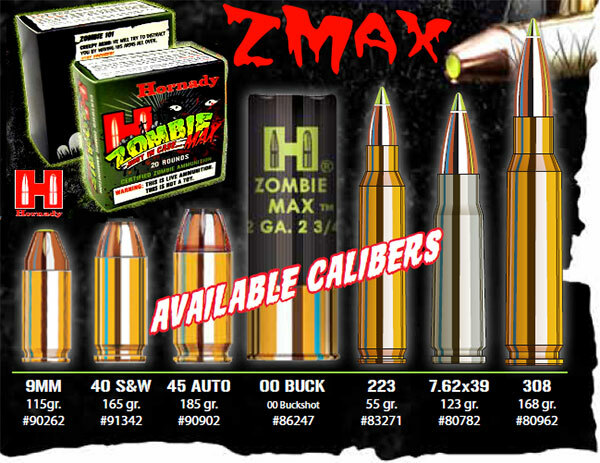 CLICK HERE to View Hornady Zombie Max™ Sell Sheet (PDF). Share the post "Hornady Introduces Green-Tipped Zombie Max™ Ammunition"
I am well above the legal age to purchase a firearm and ammunition, but I NEVER HAVE. I’ve got family that have an interest in firearms, and my family believes strongly in the ethical and responsible use of weapons. 1. If this is your introduction to firearms, then the LAST thing you need to be shooting at is anything that is not a range target–vegetable, animal, or mineral. 2. Anyone experienced or intelligent enough to realize this is a market gimmick should already understand the correct use of a firearm. So as not to expose my family as “pseudo-enthusiasts” I will explain that they also believe in allowing people to make their own decisions. So when the subject came up at the dinner table about this firearm, they had to explain to me that Hornady was an ammunition manufacturer. You read that correctly. Before this product release I had NEVER HEARD OF HORNADY. Sport shooting is not my passtime. But you know, I am just like every other man my age. Flash food, attractive women, or something amusing in front of me, and you have my attention. Immature? Fart jokes are immature (but can we still laugh sometimes). Appealing to trending interests in the occult? That is sales 101. If you find an untapped demographic that you can easily market to, it is your RESPONSIBILITY on behalf of your shareholders to make an honest attempt at it. So you can learn to adapt, or you can face extinction. Hornady is adapting. Wouldn’t it be better advertising for the product if the guy in the video actual survived the Zombie attack using their ammunition? Who wants to buy Zombie ammunition that doesn’t work? now available in 380 Auto which make it easier to carry. So those damn Zombies won’t see it coming. 357 magnum revolvers as well. As for the nay Sayers…don’t knock good ammo because our society includes idiots…just pray like the rest of us they don’t hurt anyone but themselves if they do something stupid. Lighten up, it’s just a marketing gimmick. Yes firearms are to be taken very seriously, but most gun owners are responsible and mature. They can see this is just a gimmick, and to be brutally honest, if you are so stupid as to go to a known ammo dealer and purchase live ammo and treat it as anything but obviously lethal, maybe reducing their attendence in our herd is a GOOD thing. There are those of us who appreciate good humor, and I applaud Hornady for introducing this line of ammo for those of us who enjoy target shooting. It’s serious business, but why not have fun! Nothing wrong with a marketing gimmick. I might get some for the AKM I am constructing (7.62x39mm), and while I realize this ammo is intended as a shot at humor, I’m pretty sure most people with a brain know that it’s live ammo and should be handled seriously. I just hope they come up with it in other calibers (7.62x54R would be a nice one for my Mosin sniper rifle project) and I also hope that people take safety, rather than this awesome box, seriously. By the way, who wants to wager a bet on what line of ammo this really is? Wow, these bullets look like fun! Will they fit in my daddy’s gun?